Mwhahaha another Halloween installment here! It's been a bit dead these days I apologize for it its a combination of wi-fi loss, my own icky cold, and now a hurricane (Sandy) hitting DC. Seriously it's crazy! Everything has been ripped off of the shelves and the schools are closed even the metro shut down! Well its great for polishing up my nails so here we are. This is another Bundle Monster one. I've been wanting to use this plate since I got them but held off until now. So let's talk about a few things here - CrowsToes Halloween collection is seriously giving me chills! HHNF - first of all did any of you see Rosanne in She-Devil that late 80's movie? Oh lawd I think about it every time I see devils. So funny! 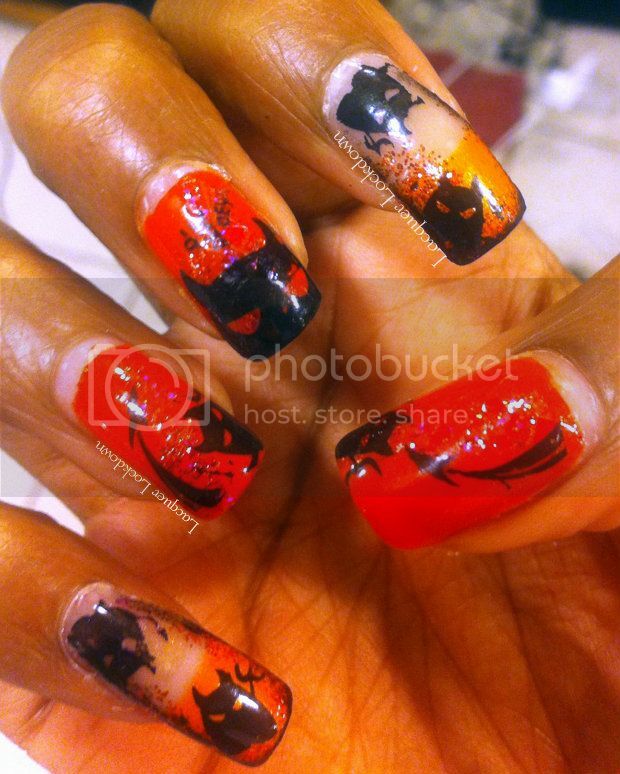 HHNF is so perfect and just the right combo of purple and orange-red yumminess for this mani. I also have to say thank you to Lauri who sent them to me as a ROAK. Seriously YOU rock lady! Kindness has always been my weak point and this lady has continued to maintain her kindness and grace even when her family has been going through such difficult times. She is a treasure and her polishes make me drool! My friends in the blog-o-sphere can attest to that! But hey when you're working it you're working it and Lauri is always fierce! Sephora's Pantone Universe 2012 - I've had these for a while and I have no idea why I never used them they've just been hanging out. Opaque in three coats for the creme and drying to a near squishy like jelly finish. What's not to love? I'm not sure of the availability of these anymore but the determined lacquerista should be able to make it happen if she wants them. So thoughts, comments, mindless adoration? Lol kidding! 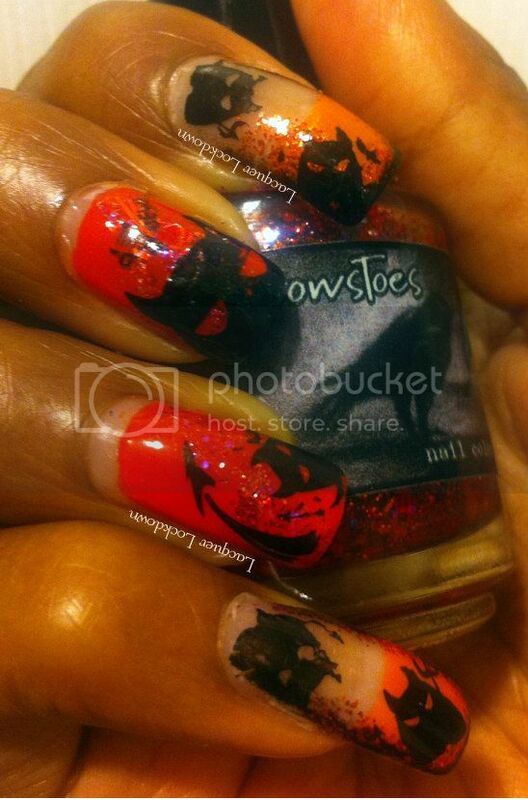 I'm having fun with these Halloween mani's. I wish I had been able to do more curse the luck! Oh well there is always next year ;) Let me also take this time to say thank you thank you thank you to everyone who voted for me in the Bundle Monster Contest!!! I didn't make it into the top 15 but it was really fun creating the look. Also for those that didn't know it I won that inaugural entry for Leah Anne's new website and blog LLarrowe! Woot! Thank you for those too who always encourage me and give me the faith to continue on! Perhaps they really do like me??? **Gazes into the distance with a faint look of surprise** Okay enough sillies. See you next post and thanks for reading! Llarowe Style: Under Da Sea..
Skulls and Crossbones Oh My...On Sundays I Stamp! LDTTWC Day 8 - Let's Do The Time Warp Again! LDTTWC Day 5: We Can Do It!